This post is not especially aimed at Londoners or those researching their London ancestry, although they may well find it helpful. I am writing it instead in response to quite a bit of feedback, via Twitter and elsewhere, among Genealogists, who do not like the new FamilySearch website. In an effort to try and understand for myself what was going on, I went along last Thursday to Sharon Hintze's talk at The National Archives called "What's happened to the FamilySearch website?" Sharon Hintze is a Director of Family History Centers worldwide and is currently based at the main London Centre in Exhibition Road. She gave a most informative talk. 1) Firstly, all experienced genealogists should not be using the main search on the new Family Search website, but they should instead go straight to the Advanced Search page. 3) If you are looking for Historical Records, it is important to make sure you have selected this tab. The Family Trees tab at present contains records from Ancestral files, but in the future, users will have the option of submitting or adding to their own family trees (a bit like Ancestry trees I suspect). 4) If you are looking for the old English, Scottish or Irish records, it is important to realise that these records are all now included as a subset of "Europe" rather than the "British Isles" - yes times change! So after going to Advanced Search, try selecting Europe (from the bottom of the page) and then United Kingdom. (from the list on the left). You should then find a long list of about 30 different UK Historical Collections. 5) At the top of this list is the largest UK collection, called "England Births and Christenings, 1538-1975". It is within this collection that can be found the old IGI baptisms which many of us genealogists have found so useful in the past. Similarly, the old IGI marriages are found in "England Marriages, 1538-1973". 6) If you only want to search collections with actual images, you will see that quite a few of these UK collections have a small camera icon to the left-hand side. But don't deceived, if you search for a record in these collections, you will be directed towards the subscription site FindMyPast in order to view the actual images concerned. However, even with a subscription to FindMyPast, the link simply directed me to the FMP search page, so I would have to search all over again, which seems pretty pointless. 7) You will notice if you try to use them, that these Collections are not very easy to use, due to a lack of more detailed geographical breakdowns than, say, Middlesex. Londoners, in particular, will know how frustrating that is. I searched for my Edward Clifford, Mathematician, in the 1841 census (as I know he is there, in West Brompton), but could not easily find him! 8) If you do manage to find your ancestors' records in one of the three main UK Births and Baptisms, Deaths and Burials, or Marriage Collections, you will notice that there is an entry called "Source Film Number" which is the same as the source film number in the old IGI. 9) Also, if you find a christening and want to search for siblings, it is actually easier with the new site to feed in parents name, place and approximate date, and up come up with all the siblings. I have only tried this so far on my previously known ancestors, so it will interesting to see how useful this will be for new searches, but it actually looks a bit easier than the old IGI. Hurrah! 10) Finally, Sharon did stress that the new Family Search site is still under development and that the development team is keen to receive feedback. There have already been several minor improvements since I started looking at the new site, possibly because of our feedback. So I urge you all, and Sharon stressed this too, to please give feedback on the site. You can do this by clicking on feedback tab on the far right of the homepage, and following "share your ideas" or simply by clicking here. You will need to register (if you're not already registered) but I would say that, despite this, it is well worthwhile. Please feel free to comment (below) if you have any further suggestions on this subject. Thank you for that overview. I've been using the old Family Search site for years but have found the new set up quite confusing. Its very useful to know what collection the old IGI files are now within. Thanks for the tips Rosemary, I will try to keep them in mind when using the new site. Thanks Lazylover and Geniaus for your comments. I, too, was very confused when I first saw the new site, which is why I have tried to understand it all, and help others. Don't forget about giving them feedback - they need it! I’m looking forward to your on-going posts. Thank you so much, Kerrf. Very interesting blog you have there, which I will also follow with interest. Kerry beat me to it! 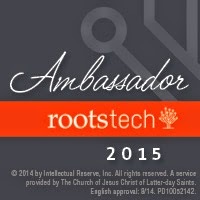 I too have nominated your blog for the Ancestor Approved Award in a post at Genealogy Leftovers. Brilliant advice Rosemary - I have struggled with their new site lately, whereas the old one was so easy to use. It gets a reprieve now, so i'll go back and give it another go. Good luck using the new site, familytreeuk. I hope you find it gets easier. I now use both the old and new site! Judy, thank you so much for nominating my blog for the Ancestor Approved Award in a post at Genealogy Leftovers. I have chosen you for the "One Lovely Blog Award!" Please visit my blog, http://golgolgirl.blogspot.com/2011/03/one-lovely-blog-award.html for your badge and acceptance rules. Thank you Kay for nominating me for the "One Lovely Blog Award". I hope you don't mind if I don't promote this new award until I have managed to find time for another blog post. But I am indeed most grateful.